Following HISTORY®'s broadcast airing of the larger-than-life miniseries event on September 1st and 2nd, Houdini will be available on Digital HD the following day on September 3rd. Then, unveil even more of the secrets behind the greatest magician of all time in the extended version of Houdini on two-disc Blu-ray (plus Digital HD) and two-disc DVD (plus Digital) October 7 from Lionsgate Home Entertainment. Boasting an all-star cast including Academy Award® winner Adrien Brody (Best Actor in a Leading Role, The Pianist, 2002) as The Great Harry Houdini, Kristen Connolly (Netflix's "House of Cards") and Evan Jones (Gangster Squad), the scripted four-hour event chronicles Houdini's extraordinary life as he finds fame while defying death with his incredible stunts and illusions. His ability to escape from handcuffs, strait-jackets and water tanks is legendary - breaking the shackles of his past proved more challenging. HISTORY®'s Houdini follows the world-renowned master of escape's transformation from immigrant into the world's first superstar. Driven, disciplined and actively chasing the American Dream, Houdini constantly pushed his physical limits to accomplish feats of strength that amazed audiences in an age of spectacle. And though they saw what he wanted them to see, his reality was more elusive than his escapes. 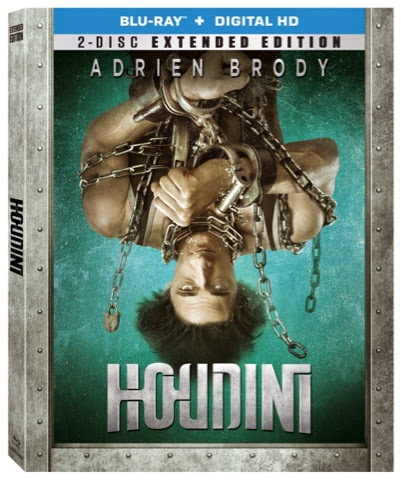 The Houdini two-disc Blu-ray and two-disc DVD feature both the original HISTORY®televised version as well as a brand-new extended edition with over 20 minutes of additional film footage of the captivating series. The Houdini Blu-ray and DVD also include four behind-the-scenes featurettesand will be available for the suggested retail price of $29.99 and $26.98, respectively. Houdini is based on the book Houdini: A Mind in Chains: A Psychoanalytic Portrait by Bernard C. Meyer, M.D., and written by Academy Award®-nominated screenwriter Nicholas Meyer (The Seven-Per-Cent Solution, Best Adapted Screenplay, 1976) and directed by Uli Edel, who directed the Academy Award®-nominated film The Baader Meinhof Complex (Best Foreign Language Film, 2008). Houdini is a Lionsgate/A+E Studios co-production.